As I listen to presidential candidates on both sides of the aisle talk about income inequality, my mother’s comment swirls in my own overcrowded brain as I try to sort through whether any of the candidates offer practical ideas for restoring some sense of balance to our country. And for the first time in my life, I am an undecided voter. Because the media seems to reprint mostly sound bites taken out of context, I spend a lot of time tracking down full texts of the candidates’ speeches in an effort to decide whose ideas have the best chance of helping us conquer the defining challenge of our time, which Atlantic magazine describes as an income gap worse than at any point in history. What I have learned in my research is that the gap has stymied leaders in both parties since the birth of our nation. One of the reasons why I am opposed to Slavery is just here. What is the true condition of the laborer? I take it that it is best for all to leave each man free to acquire property as fast as he can. Some will get wealthy. I don’t believe in a law to prevent a man from getting rich; it would do more harm than good. So while we do not propose any war upon capital, we do wish to allow the humblest man an equal chance to get rich with everybody else….I want every man to have the chance—and I believe a black man is entitled to it—in which he can better his condition—when he may look forward and hope to be a hired laborer this year and the next, work for himself afterward, and finally to hire men to work for him! Lincoln also tells a story of how even the clergy are influenced in their interpretation of the scripture when a guinea is placed over a passage that might suggest their actions are immoral. The speech is a fascinating piece of rhetoric about the influence of money in politics and an insightful glimpse into how Lincoln struggled to reconcile his beliefs to the reality of politics in a divided nation. 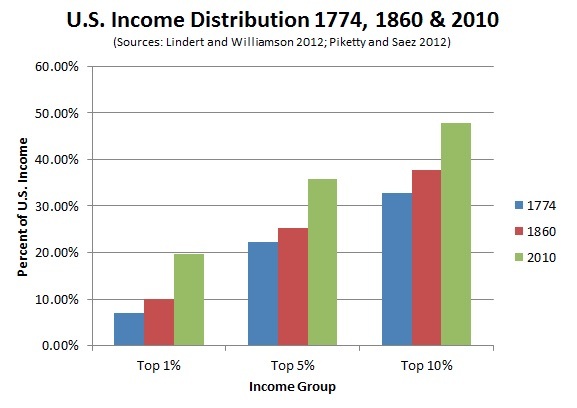 The top 10 percent no longer takes in one-third of our income — it now takes half. Whereas in the past, the average CEO made about 20 to 30 times the income of the average worker, today’s CEO now makes 273 times more. And meanwhile, a family in the top 1 percent has a net worth 288 times higher than the typical family, which is a record for this country…The opportunity gap in America is now as much about class as it is about race, and that gap is growing. So where does that leave us in an election where the candidates offer us little hope of finding a leader who can bring us together for the common good? I don’t want to be like my mother, who stopped voting because she said, “What’s the use in voting one dirty bunch out and another dirty bunch in?” But, increasingly, I understand why she felt that way. Like a lot of other voters, my mother came back to the polls when Barack Obama offered Hope. But I suspect that if my mother had lived, she would not be voting in this upcoming election. I will be voting, though at this point I’m unconvinced by politicians who largely seem to be talking to hear their heads rattle and whose motives I sometimes question. …when you question a man’s motive, when you say they’re acting out of greed, they’re in the pocket of an interest group, et cetera, it’s awful hard to reach consensus. It’s awful hard having to reach across the table and shake hands. No matter how bitterly you disagree, though, it is always possible if you question judgment and not motive. Perhaps this is the reason Biden is the Obama administration official most often sent to the Hill when Congress is at an impasse. And if Biden is still considering entering the race, this should probably be at the top of his list of reasons to run. For all his bluntness and all his gaffes, he is the only politician out there who still seems to believe it’s possible to reach consensus. This week one of my young friends asked me excitedly if I’d seen Biden on the Late Show with Steven Colbert. I had. She told me that she could see herself voting for Biden. For a brief moment he gave us, two women from very different generations, a reason to hope. Whether Biden or any candidate can survive the current political climate to govern effectively is anyone’s guess. But at all the nation’s best moments in history, a person of character and vision and sound judgment has come forward to lead us. And that is the person for whom I hope to cast my vote. Previous PostHe is Heavy. But He’s My Brother.Next PostIs the Accuplacer Accurate? The person you’re looking for is Bernie Sanders. I was impressed with Sanders’ speech at Liberty University, particularly how he spoke about finding ground where progressives and liberals could agree. But as the Washington Post pointed out in a recent editorial, when you advocate free college tuition for everyone, you’re offering it to the wealthy, who don’t need it, and that would add a significant amount to the already scary deficit. So I’m not convinced.